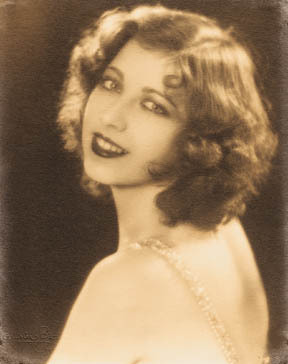 Portrait of Carla Laemmle in the 1920’s. I was thrilled to receive a press release in my inbox today for the event marking the 103rd birthday of silent film actress Carla Laemmle, one of the last surviving personalities from the silent era. The niece of Carl Laemmle, who was a major figure in silent film and the founder of Universal (and who, as you will see below, has added status as a rescuer of a number of Jews from the Holocaust), Carla was featured in a number of small parts, including The Phantom of the Opera (1925) and Dracula (1931), and though she has been formally retired from films since the 1930’s, she is an active and vibrant participant in many classic film-related events. 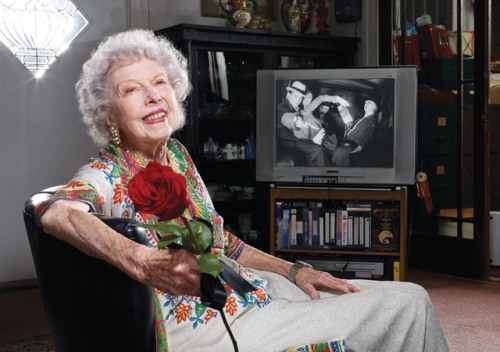 At the age of 102, she appeared at the TCM Classic Film Festival this past year and was also present as a special guest when I covered Cinecon this past September. She is especially noted for her sharp memory and magnificent poise–it is very difficult to believe that this beautiful woman is 102 years old! An interview that Carla did with Leonard Maltin at this past year’s TCM Festival. The video was recorded by my friend Theresa Brown, and this link comes courtesy of her. Another thing that is well-known about Carla Laemmle within the classic film community is the devotion, warmth and openness of her family. Each birthday she has, her family organizes large gatherings for which invitations are given to just about everyone–family, friends, fans, press, anyone who may have had anything to do with her in the past or present. A friend of mine once told me that when she was living in Hollywood, she sent Carla Laemmle a card for an upcoming birthday. A few days later, a relative of Laemmle’s showed up at her door to thank her personally for the card, and to invite her to Laemmle’s birthday celebration. This is the kind of family she has, and I must say that I think this is likely a huge factor in her longevity. Here are the details of what will be happening tomorrow evening. You do have to have an invitation to actually attend, but you may be able to show up and see her enter the building, which promises to be an event in itself! Hollywood, CA – On October 20th silent film actress Carla Laemmle will celebrate her 103rd birthday at The Cinefamily Silent Film House Theater in Hollywood. Invited guests will enjoy a screening of clips from the actresses’ career that spans from the silent picture days, where Carla played the prima ballerina alongside Lon Chaney (Phantom Of The Opera in 1925), to the early talkies in which Carla spoke the first lines in the Bela Lugosi’s classic “Dracula.” Guests will also get a sneak peek at Carla’s newest role in the very latest Hollywood content outlet, a web series entitled “Broken Dreams Blvd” starring Danny Aiello. The series is written and directed by family friend Kevin Jordan. Carla plays the great grandmother to Nic Novicki (Boardwalk Empire) who with Carla runs the oldest tour bus company on Hollywood Blvd. Quite fitting since her Uncle, Carl Laemmle, not only founded Universal Studios but also created the Hollywood tourism trade. Laemmle was the first to allow visitors behind his studio gates, where he offered trolley tours to film fans for a nickel. ” We wanted to tell the story about our friend and cast member of our TV Web show and honoring her on her amazing 103rd birthday. She is terrific in our show “, states Nic Novicki, star and co-writer of “Broken Dreams Blvd”. During WWII, Carl Laemmle was known to have rescued survivors of the Holocaust and sponsoring them to enter the United States. Five of these survivors will attend on Saturday including Sandy Einsteinn. The celebration will also include a live organ player to accompany Carla’s ballet performance in Phantom Of The Opera and a 1920s quartet. ” A very special night ahead for a very special woman. There aren’t that many 103 year olds still filling out W-9s!.” , said Nic Novicki, Producer and cast member of “Broken Dreams Blvd”. Celebrity Hosts include: Danny Aiello, Nic Novicki(Boardwalk Empire), Renee Taylor( Happily Divorced), Joe Bologna(CSI), Ed Lauter(Trouble With Curve) – Also: Rosemarry Hill(great niece of Carl Laemmle), Bella Lugosi Jr., Tyrone Power Jr., Jane Withers, Bruce Garrick (My Three Sons), Barbara Luna (Ship of Fools), Oscar nominated Lainie Kazan, and Edward Lozzi. Other celebrities on the Event Committee attending include: Carla Laemmle (Phantom of the Opera, Dracula), Danny Woodburn (Mirror Mirror, Seinfeild, Death to Smoochy), Steven Martini (Major Payne, Limelife), Mark Povinelli (Water for Elephants, Are you there Chelsea), Kevin Jordan(Brooklyn Lobster, The House Guest) Edward ‘Grapevine’ Fordman (One on One, Punk’d, Key and Peele), Will Styles (House of the Rising Sun, Hope and Faith), Marty Ingels(CSI), Brenda Dickson(Young & The Restless),Jack Carter(Shamless), Chuck McCann(Boston Legal), George Barris, Ron Masak(Murder She Wrote), Lou & Carla Ferrigno, Director Gabriel Bologna(Boston Girls), Francesca Hilton, LouWegner(Trouble With the Curve), Charles Fleischer (Roger Rabbit), Arthur Gardner(All Quiet on the Western Front 1930) cast members from “Boardwalk Empire”,casting director Marvin Paige, and many others coming on board. Wow — wish I didn’t live across the country! My gosh, Carla looks better than I do, and I’m decades younger than her! She is incredible. And have you heard her speak? She sounds like she’s about 50! Agreed! Happy birthday to her! There is no way that woman is 103. She looks amazing! I know, I’m pretty sure she looks younger than I do! !